Arriving in 2019, and priced from $75,795, the 2020 Audi E-tron is an electric 5-passenger SUV with a 28.5 cubic-foot trunk and up to 57 cu.-ft. of maximum cargo space. The Audi E-tron accelerates to 60 mph in 5.5 seconds, tows up to 4,000 pounds, and travels about 200 miles on a full charge. Using a 150 kW DC fast charger, the battery soaks up enough juice to provide an 80% charge, supplying 160 more miles of go-power. A 240-volt home charging station re-charges an empty battery in nine hours. Sound good? You can pre-order one at your local Audi dealership right now, choosing between Premium Plus, Prestige, and First Edition trim levels. Or, you can learn more about the new E-tron below. Electric SUVs are odd looking. From the boxy Bollinger B1 to the egg-shaped Tesla Model X, with the sci-fi Faraday Future FF91 staking out ground in between, they don’t fit the conservative leanings of most car buyers. Enter the Audi E-tron. Drawing from common Audi design themes and looking much like a special version of the new Q8, the E-tron is evolutionary rather than revolutionary. There is a grille, for starters, painted Platinum Gray to signal the E-tron’s electric drivetrain. The grille isn’t functional because electric vehicles don’t require one. Rather, consumers prefer one. Size-wise, the E-tron slots between the Q5 and Q7, but it offers slightly less cargo space than the Q5. Battery charge status lighting is integrated into the headlights, while black door inserts visually signify the size and location of the SUV’s battery. A horizontal rear LED light strip identifies the E-tron as a member of Audi’s premium vehicle family, while slats in the diffuser panel suggest the exhaust outlets unnecessary for the E-tron. Boasting a coefficient of drag measuring 0.30 cD, the E-tron is slippery for an SUV. It sits on 20-inch aluminum wheels and 255/50 ultra-low rolling resistance tires, which are bolted to a standard air suspension that lowers the vehicle for improved aero efficiency and raises the vehicle for off-roading excursions. First Edition trim installs standard 21-inch wheels. With the E-tron, Audi isn’t trying to rethink interior design. Yes, the instrumentation and center controls are digital but this is a direction Audi is heading anyway. As a result, modern car buyers will feel right at home in the new E-tron. Again, the E-tron’s interior design looks much like the Q8, the dashboard’s stepped, driver-oriented, high-tech design includes a unique hand rest near the gear selector. Audi promises a range of leather and inlay selections, and seat stitching intends to convey “the precision of electric circuit boards,” according to the company. Passenger space is generous, according to Audi, and is bathed in natural light thanks to a standard panoramic sunroof. Five adults should fit with little complaining. Standard equipment includes 12-way power adjustable front seats with heating and ventilation, a 4-zone climate control system, and a 16-speaker Bang & Olufsen premium audio system. Audi will offer an optional Air Quality Package for the E-tron, which installs an ionizer and cabin aroma system. Ambient lighting is another upgrade, along with multi-contour front seats with a massage feature. 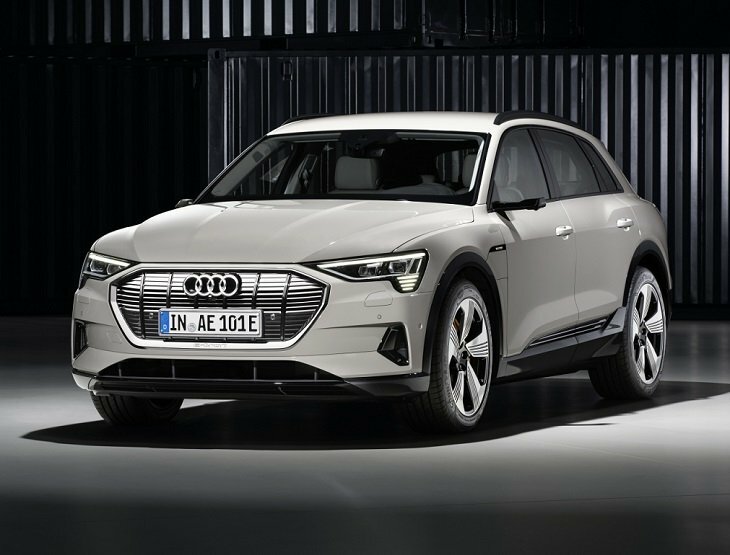 A 95-kWh battery supplies power to two asynchronous electric motors that drive all four of the E-tron’s wheels. Horsepower and torque figures for the U.S. market are not final, but Audi does say that maximum torque arrives 250 milliseconds after the driver plants the accelerator pedal. The E-tron hits 60 mph in 5.5 seconds and can reach 124 mph. I estimate a driving range of 200 miles based on Audi’s claim that an 80% battery charge is good for 160 miles of driving. The charging system is compatible with everything from a 120-volt household electrical outlet to 150 kW DC fast charging stations. Audi is partnering with Amazon Home Services to install home charging stations, and with Electify America to supply charging locations away from home. Fast charging stations will be available in most states and major metropolitan areas, and Audi includes 1,000 kW of free charging with every E-tron lease or purchase. Braking recuperates energy to extend battery life. A paddle on the steering wheel sets three different levels of coasting, too, from no regeneration to an aggressive setting that allows for one-pedal driving. Efficiency Assist advises the driver based on navigation data and the planned route, helping to maximize driving range. Audi calibrates the electric Quattro AWD and the brake-induced torque vectoring system for a rear-drive feel. Audi Drive select provides seven different dynamic profiles, including an Off-Road mode and a Raise mode that, when used together, increases ground clearance by two inches. Progressive variable-ratio steering makes urban driving easier. Every E-tron comes with a blind spot monitoring system with front and rear cross-traffic alert. Additionally, the E-tron offers Lane Change Assist, Intersection Assist, and Vehicle Exit Warning systems, each designed to prevent a driver or passengers from taking ill-advised actions. Standard surround view cameras also help to safety maneuver the E-tron in confined areas. As an option, a Driver Assistance Package equips the E-tron with new Adaptive Cruise Assist technology. A sophisticated advance taking into account a wide variety of driving conditions, this system also navigates construction zones and adapts to whatever driving program is currently selected. Standard with the E-tron First Edition, a Night Vision Assistant helps the driver to navigate better after dark. Audi’s Multi-Media Interface Touch-response (MMI Touch) technology is standard in the E-tron. It equips the SUV with a 10.1-inch upper display for managing infotainment and drivetrain functions, and an 8.6-inch lower display for calibrating comfort and climate functions. If using smartphone-style screens with tactile and acoustic confirmation is a concern, especially while driving, the E-tron is equipped with natural language voice recognition technology for controlling most functions. The SUV is also Alexa-integrated and -enabled. Audi Phone Box with smartphone integration and inductive charging is standard, as is Navigation Plus and a free 6-month trial of Audi Connect Plus services including Wi-Fi connectivity and an E-tron route planning function that takes into account charging locations. A MyAudi smartphone app allows for remote access to vehicle functions, including the ability to program vehicle charging during off-peak electricity rate hours. High-resolution Audi Digital Cockpit instrumentation is standard, adding specific E-tron data for this vehicle. A head-up display is available as an option, and Park Steering Assist autonomously steers the E-tron into parallel and perpendicular spaces while the driver controls the pedals and gear selection.